PHOENIX — Arizona’s quail hunters have had it rough. Ask them to recount their best hunt in the past few years, and most will look down at their dust-covered hunting boots and shake their heads. Well, if the results from the latest Gambel’s quail call counts are any indication, those hunters just might find a few more birds to chase when the 2017-18 general season opens statewide Oct. 6. The Arizona Game and Fish Department conducted its traditional call-count routes from about mid-April to mid-May near Oracle. A call count involves department personnel stopping every mile along a 20-mile route, then recording the number of calls made during a three-minute span. The scale ranges from zero to 3,500 calls. If 1,000 to 2,000 calls are heard over the course of a 20-mile route, those results would indicate that hunters could expect good, or even very good, hunting. This year’s results indicated numbers are up from 2016 and higher than the average of the last 10 years (2008-2017). The combined call count from along Freeman and Willow Springs roads was 2,336 — almost double from last year (1,293). The average over the past 10 years is 1,870. “Things look good this year,” said Johnathan O’Dell, the department’s small game biologist. “We’re 25 percent above the 10-year average and certainly better than last year for Gambel’s at 80 percent higher than in 2016. 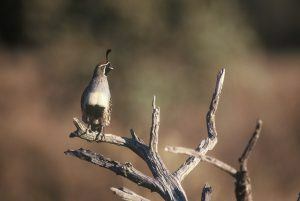 More information: www.azgfd.com/hunting/species/smallgame/quail/. Also, watch how O’Dell field-dresses quail at www.youtube.com/watch?v=3gRwZAcWzzk.